Fostering civic engagement among Chicago’s young people is no small task, and the Chicago Architecture Foundation has “No Small Plans” to tackle it. “No Small Plans” is a new graphic novel spearheaded by the foundation and members of its Teen Academy. It weaves the history of Daniel Burnham’s 1909 Plan of Chicago together with the neighborhood issues of the city’s past, present and future. Below, an excerpt from “No Small Plans” opens on Chicago’s 606. One of the novel’s teen protagonists, Natalie, has just learned that her family is being evicted from their apartment in one of the gentrifying neighborhoods along the park. Natalie, her family and friends, struggle with the news. The Chicago Architecture Foundation published “No Small Plans” as the centerpiece of its “Meet Your City” initiative in partnership with Chicago Public Schools and Chicago Public Library, and with support from the American Planning Association. The graphic novel was created by Gabrielle Lyon, Devin Mawdsley, Kayce Bayer, Chris Lin and Deon Reed. July 12: One of Frank Lloyd Wright’s finest public buildings is ready for the public again. We take a look inside the restoration of Unity Temple. July 11: You’ve heard Chicago described as the City of Big Shoulders and the City of Neighborhoods. Writer and photographer Larry Broutman offers yet another nickname: the City of Monuments. Learn why. 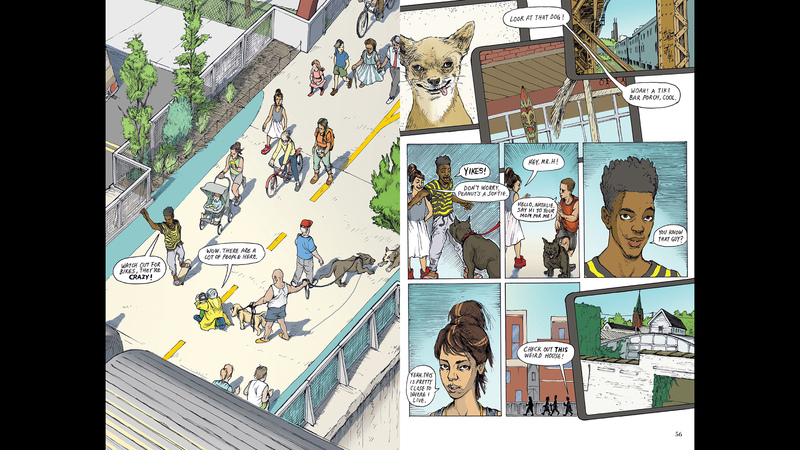 April 27: In a new graphic novel from the Chicago Architecture Foundation, teens – past, present and future – traipse through Chicago neighborhoods to ponder some big questions, such as: What makes a community?